Recently, I’ve been thinking a lot about the importance of getting more book reviews. They mean more to writers than many readers know, especially in this new digital world of algorithms and advertising. Good reviews can boost a book’s profile into the stratosphere while bad reviews feel like a ball-and-chain, dragging books to the bottom of the publishing ocean. I’ve recieved unfavourable reviews myself. Thankfully, though, I haven’t encountered a truly horrible one yet (touch wood). But that doesn’t mean that I don’t think about them. It will happen one day. As my readership grows, the odds of getting one increases. In a way, this blog post is my way of preparing myself for that moment by thinking about the benefits of bad reviews. 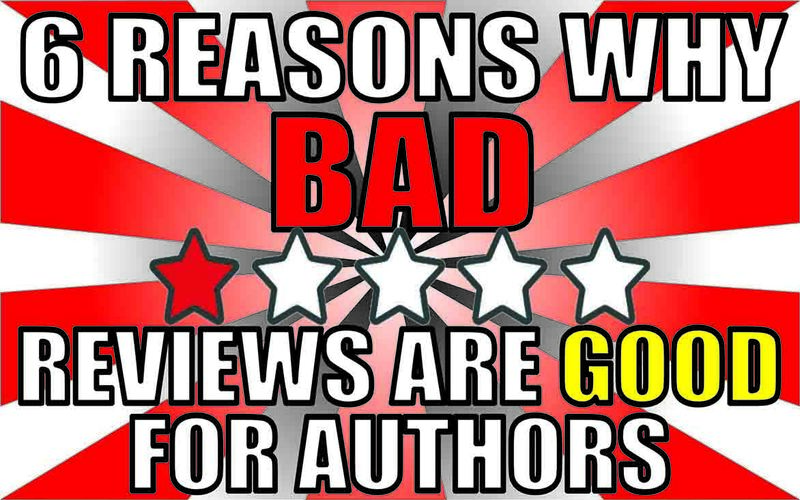 Many writers see bad reviews as a personal attack. And I can understand why. Books take a long time to write. You invest so much of yourself into them that they almost become an extension of your own identity. Reading bad reviews (or even criticism inside a good review) may feel like being stabbed in the heart with a sharp object. But what most writers don’t realise is that the sharp object is, in some cases, actually an adrenaline injection that’s saving their life. Not every review will be a five-star review. This is a truth that writers learn pretty soon after starting their career. It doesn’t mean what you’ve written is bad or wrong. It could be that the particular reader who chose to pick up your book is just harsh critic who never gives any book higher than three stars. It could be that they used your book to try something new. Having not liked your chick-lit novella, they’ve chosen to give you two stars because, as a hard-core horror reader, it’s “not their thing”. Remember, not everyone judges a book objectively; most judge it based on how much they liked it compared to what they normally read. Some judge it against the classics. Some reviewers may just tear your book apart because they were in a bad mood when they wrote the review. It’s not personal and it won’t stop happening once you get more successful. Using early negative reviews is a great way to battle-harden yourself in preparation for when you raise your profile. Here, I’m talking about my favourite type of bad review (yes, I have a favourite type). Thankfully, as I mentioned, I’m yet to have a completely devastating review so this type has always included a positive remark. However, even if they didn’t include pros, the cons are what make them interesting. Constructive criticism tells you what the reader didn’t like, or in some cases – and this happens more often since the rise of self-publishing – where you’ve left typos and spelling mistakes. Embrace this type of review. Even if they don’t give you advice for writing better in the future, they will, at the very least, help you redraft your badly reviewed work for a second edition – which will surely get a better reception afterwards! There’s a massive difference between the habits of average writers and successful writers. Most bestselling authors work hard, churning out titles every year, each having been improved by (expensive) editors, cover designers, and marketers. They invest time, brain-work, and money into each book. If you’re not sure if you’re doing enough to compete with that then this this is where bad reviews can help you. If the story needs to be proof-read, then critics will say so. If it requires a complete plot overhaul, then reviewers will say that it left them feeling confused or disappointed (which is a cue to hire a good developmental editor in the future). What writers have to remember is that their book – to the emotionally uninvested public – is just another product, one which is being tested by the market. Bad reviews act like sample questionnaires. They tell you if what you’ve written is ready for public reading. And if not, you know you have to raise your standards pretty quickly. If you don’t know whether you’re doing enough to become a success, then check out What Serious Writers Actually Do All Day. It could point you in the right direction. Everyone is suspicious of a book that has only a handful of reviews that are all five stars. Here’s the reason why; new writers pressure their friends and family to write positive reviews on review channels to kick-start their careers. Some have even been known to pay companies to give them glowing reviews (not recommended). These are not helpful. In most cases, readers can see right through the faux acclaim and will be harsher for being lied to when it comes to leaving reviews of their own. A few three star reviews never hurt anyone. They tell potential readers that your book has been read and at least considered worthy of an average review by an honest critic. It may take a little longer to get honest reviews than if you payed for fake ones, but they’ll be far more helpful to your career in the long-run. Believe it or not, I’ve actually formed valuable partnerships off the back of critical reviews. A recent one, which I won’t reference here, actually proved to be very helpful. The review itself was posted on a little-known forum and was a rollercoaster of criticism and praise, but by the end I was so impressed by the reader’s meticulousness that I contacted that person directly and asked them if they provided editorial services. They didn’t, but they told me that they had learnt a lot from their editor (as they were also a writer) and they pointed me in the direction of that editor. In this case, the reader’s brutal honesty and thorough analysis turned out to be a bridge to a valuable new contact. (For more on making contacts, read 6 Reasons Why Writers Should Collaborate – experienced contacts you can trust are goldmines for fledgling writers.) A trustworthy editor is hard to find so this case worked out well! Whether they’re posted by well-meaning critics, disgruntled readers, or just bitter rivals, all bad reviews offer a reality check to authors. They reveal weaknesses in your work that you may not have even known existed. They make you more resilient. They provide obstacles that, at first, may seem impossible to overcome. No matter what individual bad reviews do, if you listen to the right ones, they teach you exactly how to be the best possible author you can be. With a bit of level-headedness and determination, any writer who survives the death-by-a-thousand-cuts torture that bad reviews resemble will find any future progress and success all the more rewarding. Remember, writing is a process of continuous improvement. Even those at the top are still learning, still overcoming doubt, and still having to deal with criticism. If writing were easy, everyone would be a bestseller. Did you find this list helpful? Let me know by tweeting me at @dkparsonswriter. If you did enjoy this post then please share it. In the future, I’ll be writing more on authors, publishing, and writing, as well as anything else relevant to readers and writers. Revisit my blog any time. I hope to see you again.